This puzzle comprises two separate challenges: first building five cities and then laying two paths of destruction through each of them. Building the cities involves solving a series of skyscraper puzzle variations that make use of different shapes, starting with a regular city with just squares and progressing through more and more irregular layouts. 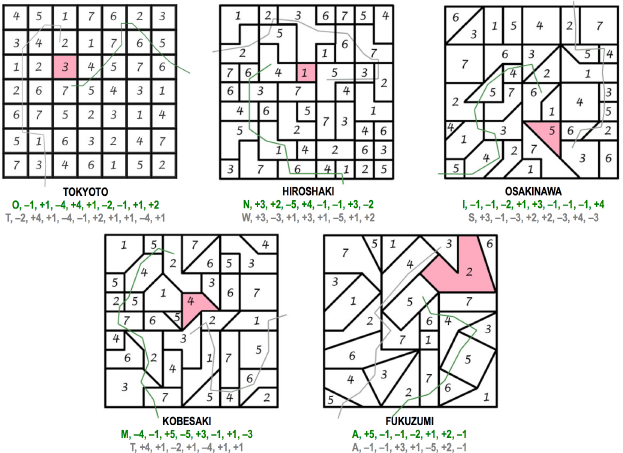 In addition to using the outside constraints to solve these puzzles, it is useful in the more irregular cities to consider that the interlocked shapes place additional constraints on what buildings can be what height. In many cases, pairs of buildings can be identified by geometry as necessarily being the same. Once the heights are established, solvers must identify ten different paths, one for each of the 'zillas in each of the five cities. Each itinerary contains a sequence of relative heights and can be either of two ranges of values (either 1-6 or 2-7). Searching through all these possibilities, there is only one possible assignment of each path to the cities. The combined paths give letters at their starting points and, in combination, define a building in each city where the monsters meet to battle. These buildings range in height from 1 to 5. Ordering letters from the heights of these building for the Godzilla paths gives NAOMI and, for Mechagodzilla, WATTS. The answer is NAOMI WATTS.